Myriam and I were the first Germanic students who went to England. When last year I applied for my Erasmus in Canterbury (Kent), it was like a dream... A dream that goes back to BAC1 when Mr Arblaster introduced the history of English literature. Don’t you remember? The Cathedral? 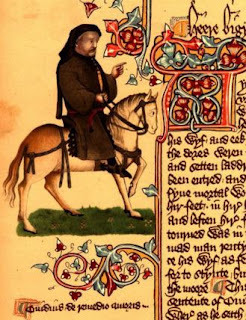 Chaucer? The Canterbury tales? So many memories... I had to go on my own pilgrimage to this centre of English history! My accommodation was located at Darwin College. 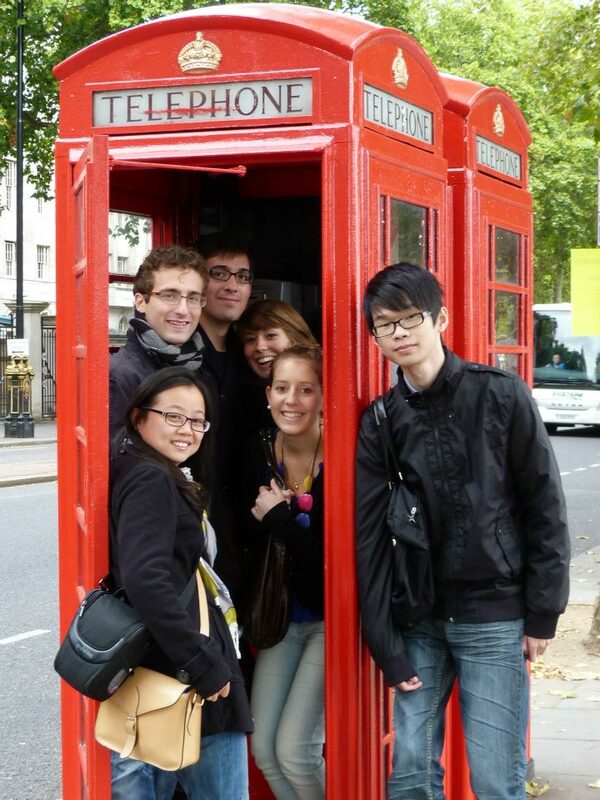 I was not in the same area as Myriam but I lived with nine room-mates from England and the rest of the world. Indeed, the University of Kent is international. You can hear French in every corridor (France is not so far). What’s more, I daresay you meet more Asian than English students. I befriended some of them, and I became a member of the Malaysian Society. The first week at the University of Kent was ‘Welcome Week’. They organised lots of events for us. Among them, a welcome dinner with plenty of food and some special parties at the Attic or the Venue, the discos on campus. On Sunday we eventually visited Leeds Castle. This is a Kentish castle, with big gardens. Next to the historical part of the visit, the estate also comprises a childish labyrinth with underground caves (not very realistic but that’s ok) and an aviary with lots of beautiful parrots. Well, Kent is probably the most exotic county of England! Canterbury is a nice, small and peaceful town. As you know, it is historic and so touristy. The cathedral is very impressive. You can’t miss it, it’s in the very heart of the town! And as a student from Kent Uni, it’s free. I visited it a few times with Myriam and other friends. And we even got the chance to see the cathedral in the evening! A Christmas carol in a Cathedral illuminated by candles, it’s worth it, I assure you! But candles are also dangerous. Fortunately, English people are very vigilant. For the Christmas carol, a member of staff was placed every 10 meters to indicate the way out in case of fire. Well, I appreciate the English watchfulness, but not when I’m still sleeping in my bed! Indeed, every Wednesday on 8 am they test the fire alarms at Darwin. Such a deafening noise for five minutes, it’s horrible! We didn’t need to evacuate for the planned tests, but we had to if it happened at another time. And it occurred at least twice a week -even by night! Well, the positive point is that you see all the girls in her pyjamas. The lectures in England are very different from the Belgian ones. First I could only take two modules, because they are worth 15 or 7.5 ECTS each. Concretely, I had lessons five hours a week... not a lot compared to Namur! The system mainly relies on self-study and essay writing. That means you spend most of the time working alone in your student room. Well, it’s not the system I prefer. However, I must admit that submitting essays is less stressful than the exams we have in Belgium. I also realised they were keen on oral presentations. At the end of the day, it was very interesting to discover another academic system. 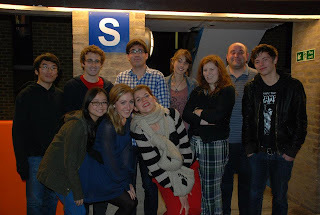 My three months at the University of Kent were a very short but intense experience. My flatmates were so nice. We had a lot of fun together, we went to parties, we celebrated Halloween and Bonfire Night, we visited many places in Canterbury and in London. I can’t say how many tons of chocolate and fondue I ate (everybody should have a Swiss friend). I can’t say how many times I went to the supermarket on campus (opening hours: 4am to 5am). I can’t say how many pizzas I cooked -and how many ‘quiches’ Myriam reheated. I can’t tell you what I did to avoid being infected with scabies... But I can say my Erasmus at Kent was one of the best experiences I have ever had!